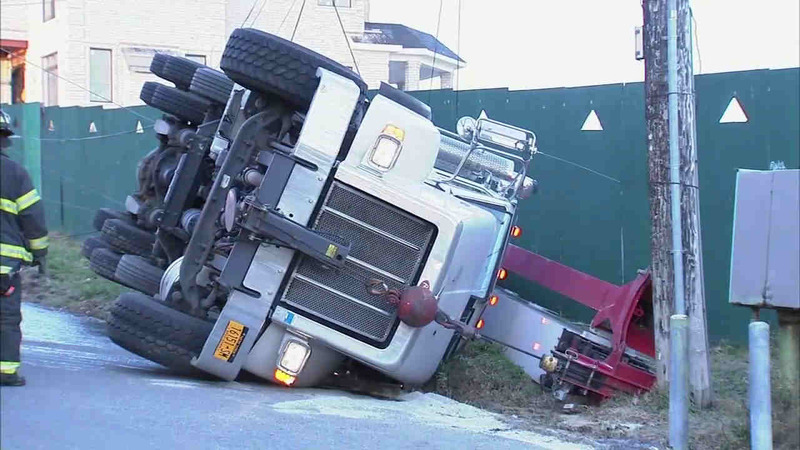 A truck hauling a crane overturned on an icy road in Queens Thursday morning. WHITESTONE, Queens (WABC) -- A truck hauling a crane overturned on an icy road in Queens Thursday morning. The boom truck apparently slid on ice caused by a leaking hydrant and flipped at the intersection of Sixth Avenue at Powells Cove Boulevard in Whitestone just after 7 a.m. The operator of the boom truck was not injured, but crews will have to use trucks to right the crane. Sixth Avenue is closed from 150th Place to Powells Cove for the cleanup.